If you follow the macrobiotic diet and enjoy sweet potatoes, try this delicious take on an old favorite. Potato salad is a favorite at the family barbecue; however, there are many potato salads that are processed and contain chemicals and food additives. It is best to make your own potato salad to get the full nutritional value that it can provide (and not the unsavory extras). The best way to get the most from your humble potato is to start by swapping regular potatoes with sweet potatoes. Potatoes are a staple in most of our diets. But the regular potato is high on the glycemic index, meaning it can cause a rapid increase in blood sugar and eventually lead to insulin resistance. 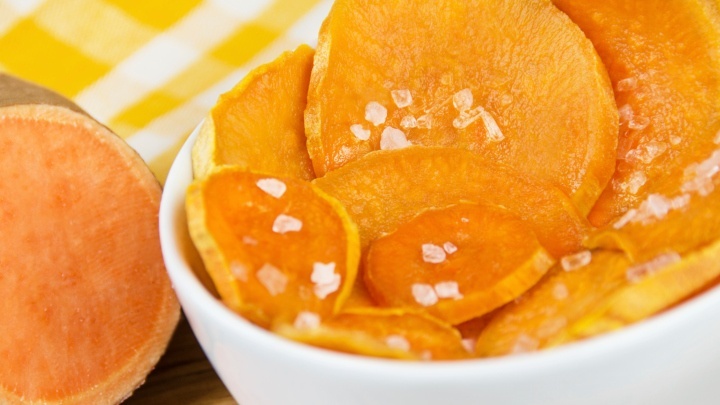 Potatoes are also loaded with carbohydrates, but if you replace them with sweet potatoes, they promote blood sugar balance as well as antioxidant protection. They are loaded with vitamins and nutrients such as iron, vitamin B6, potassium and dietary fiber. This healthy recipe is named after the macrobiotic diet because every food used falls within the diet specifications. Made famous by celebrities like Madonna and Emma Stone, the macrobiotic diet focuses on grains and locally-sourced vegetables. Followers typically avoid the regular potato, although sweet potatoes and yams are acceptable. The diet also promotes sea vegetables, and this healthy recipe contains your choice of arame or wakame seaweed. The diet recommends 5% fruit; this recipe uses two apples. Rinse and soak the seaweed in a 3/4 cup of water to soften it. Squeeze and set aside the lemon juice. Add the celery to the mix. Dice the celery or slice it into thin diagonal pieces. Grate the ginger, then add it to the bowl. Next add the sesame seeds, raw honey, tamari, extra virgin olive oil, and the seaweed (with the soaking water). It is optional to chop the seaweed. Mix very well and serve. Cabaca, E., Earthly & Divine: Whole Recipes for a Healthy World (Richmond Hill: Pronto Reproductions Ltd., 2010), 146. Colbin, A., Food and Healing (Toronto: Random House, 1986), 125-131. Mateljan, G., The World’s Healthiest Foods: Essential Guide for the Healthiest Way of Eating (Seattle: George Mateljan Foundation, 2007), 285. Schoffro Cook, M., “9 Health Benefits of Sweet Potatoes,” Care2 Healthy Living web site, Nov. 15, 2011; http://www.care2.com/greenliving/9-reasons-to-love-sweet-potatoes.html.